We are a small, home based breeder of the Australian Labradoodle. We choose to stay small so we can give all of our dogs and puppies the love and attention they deserve. We only have three dogs who live with us. We have a couple other dogs who live in their forever Guardian Homes. We have plenty of time to give our puppies and puppy families. We love to chat and stay in contact with the families who adopt our puppies. All of our dogs live in our home, or in their wonderful Guardian Homes, as members of the family. All of our puppies are raised in our home and loved from the day they are born. Every puppy comes already loved and extremely well socialized so they will fit easily into your family. We love these dogs and know you will too! Come meet us and our dogs. We know you will fall in love too! We only breed the true multigenerational Australian Labradoodle. They originated from Australia and are many generations of Australian Labradoodles bred to Australian Labradoodles. 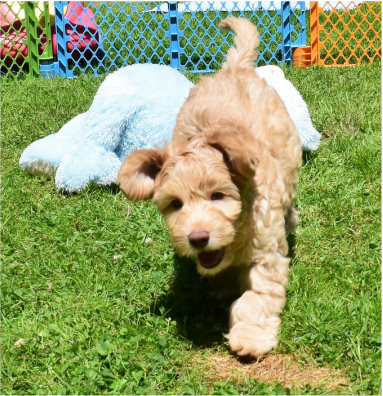 They started out as a cross between a Labrador Retriever and a Poodle but a few other breeds were introduced to create what is now known as the Australian Labradoodle. Australian Labradoodle coats are low to non-shedding and are usually great for people with dog allergies. There are three coat types: fleece, wool, and hair. Fleece: silky soft, wavy to curly coat. It is very low to non-shedding. Wool: curly like a Poodle. It is non-shedding. Hair: fur like a Labrador. It is shedding and not suitable for people with allergies. The hair coat is very rare in Australian Labradoodles. Australian Labradoodles come in three sizes: miniature, medium, and standard. Miniatures are between 14-16 inches in height (from the floor to the dog's shoulders) and weigh 16-25 pounds. Mediums are 17-20 inches in height and weigh 25-40 pounds. Standards are 21-24 inches in height and weigh 40-65 pounds. For more information about Australian Labradoodles please see our About Labradoodles page. We are proud to be an approved breeder of the Worldwide Australian Labradoodle Association and the Australian Labradoodle Club of America. We deliver to Vancouver, BC.